Posted on Mon, Dec 28, 2009 : 7:17 p.m.
Adaptive Materials, one of the Ann Arbor region's leading alternative energy companies, has landed a $3 million deal to deliver 60-watt fuel cell systems to the U.S. Air Force. The deal builds on Pittsfield Township-based Adaptive Materials' growing expertise in portable power. The company's technology uses commercially available propane fuel to replace heavy batteries in military and commercial applications. The Air Force is contracting with Adaptive Materials for fuel cell systems it expects to use in various applications, including surveillance activities and communications. The company has previously said that its technology is relevant in various unmanned aerial applications. 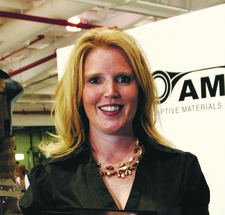 "Adaptive Materials fuel cells provide the convenience, durability and reliability that is redefining how our military meets the power needs of soldiers in the field," co-founder and chief business officer Michelle Crumm said in a news release. The firm will use the money to continue development and manufacturing of its system for the Air Force. The contract comes after Crumm said this fall that she expects the firm to land between $10 million and $15 million in government funds in 2010. The company has about 60 employees at its Pittsfield Township operation.